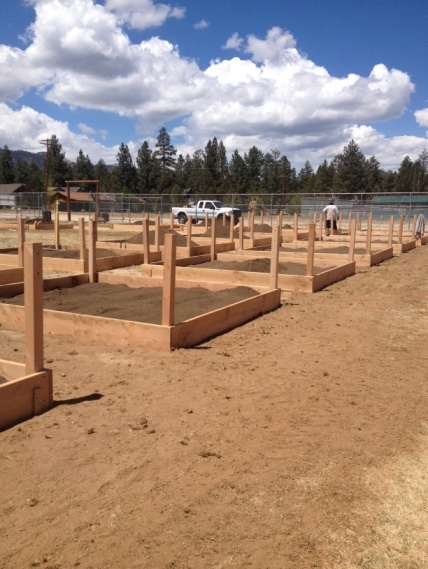 Gardeners are invited to begin planting fresh fruits and vegetables at the new drought-friendly Ranch Community Garden located at 2050 Erwin Ranch Road in Big Bear City. The site offers 10 by 12 feet garden plots filled with screened dirt and a nearby water source. Plots are $50 per year, paid annually to the Big Bear Valley Recreation and Park District, and are selling fast. Gardeners are required to use only organic soil additives and planting materials and are encouraged to grow their favorite vegetables. The garden was designed by Robbie Bos, Big Bear’s community garden guru, and built by the Park District maintenance staff, under Robbie’s watchful eye. The property used to be a large grass soccer complex that was not drought-friendly, using 15,000 gallons of water per day. The community garden is expected to consume only 500 gallons per day with the added benefit of producing food. Thirty gardening plots are ready for planting and more will be available in the near future. The weather is perfect for growing some vegetables. Gardeners can sign up for a plot by logging on to www.BigBearParks.com and registering. Gardeners may also call the Park District at (909) 866-9700 for plot assignment, or come in to the office located at Meadow Park, 41220 Park Avenue, Big Bear Lake, CA, 92315. Coming soon: 18 more garden plots, including two ADA-compliant raised beds, composting bins, wash sink and counter beds, fruit trees, redwood privacy fencing, benches, decorative education beds and large crop fields for fun crops like pumpkins and melons. The Park District is also seeking groups and students interested in gardening, tending to large crop fields and educational beds, as well as assisting people new to gardening.